Argonne physicists are using Mira to perform simulations of Large Hadron Collider (LHC) experiments with a leadership-class supercomputer for the first time, shedding light on a path forward for interpreting future LHC data. Researchers at the Argonne Leadership Computing Facility (ALCF) helped the team optimize their code for the supercomputer, which has enabled them to simulate billions of particle collisions faster than ever before. At CERN’s Large Hadron Collider (LHC), the world’s most powerful particle accelerator, scientists initiate millions of particle collisions every second in their quest to understand the fundamental structure of matter. To investigate the use of supercomputers as a possible tool for the LHC, LeCompte applied for and received computing time at the ALCF through DOE's Advanced Scientific Computing Research Leadership Computing Challenge. His project is focused on simulating ATLAS events that are difficult to simulate with the computing grid. While the LHC’s big data challenge seems like a natural fit for one of the fastest supercomputers in the world, it took extensive work to adapt an existing LHC simulation method for Mira’s massively parallel architecture. ALCF researchers Tom Uram, Hal Finkel, and Venkat Vishwanath worked with LeCompte and Argonne assistant physicist Taylor Childers to transform ALPGEN, a Monte Carlo-based application that generates events in hadronic collisions, from a single-threaded simulation code into massively multi-threaded code that could run efficiently on Mira. By improving the code’s I/O performance and reducing its memory usage, they were able to scale ALPGEN to run on the full Mira system and help the code perform 23 times faster than it initially did. 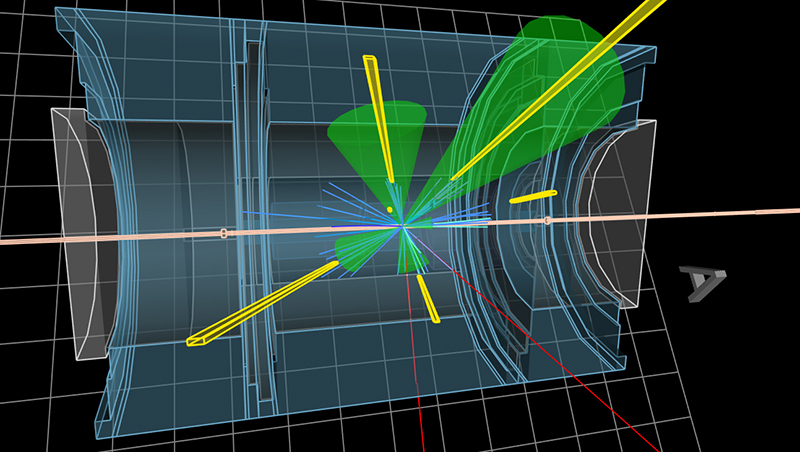 The code optimization work has enabled the team to routinely simulate millions of LHC collision events in parallel. “By running these jobs on Mira, they completed two years’ worth of ALPGEN simulations in a matter of weeks, and the LHC computing grid became correspondingly free to run other jobs,” Uram said. Throughout the course of the project, the team’s simulations have equated to about 9 percent of the annual computing done by the ATLAS experiment. Ultimately, this effort is helping to accelerate the science that depends on these simulations. As supercomputers like Mira get better integrated into the LHC’s workflow, LeCompte believes a much larger fraction of simulations could eventually be shifted to high-performance computers. To help move the LHC in that direction, his team plans to increase the range of codes capable of running on Mira, with the next candidates being Sherpa, another event generation code, and Geant4, a code for simulating the passage of particles through matter. This research is supported by the DOE Office of Science’s High Energy Physics program. Computing time at the ALCF was allocated through the DOE Office of Science’s Advanced Scientific Computing Research program. A visualization of a simulated collision event in the ATLAS detector. This simulation, containing a Z boson and five hadronic jets, is an example of an event that is too complex to be simulated in bulk using ordinary PC-based computing grids.